Close To 100,000 Hungarian Demonstrators Protest Internet Usage Tax : The Two-Way Critics of the tax said this is a government attempt to create a "digital iron curtain" around Hungary. The government said it was just extending taxes it places on phones. Thousands participants march accross the Elisabeth bridge during an anti-government rally against the government's plan to tax Internet usage. 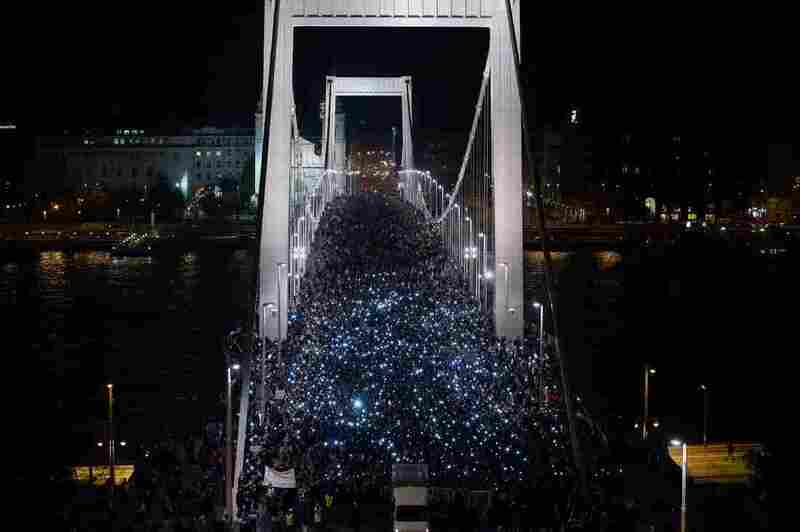 Some 100,000 people took to the streets of Budapest, Hungary, on Tuesday to protest a proposed plan to tax Internet use. The New York Times reports Balazs Gulyas, 27, a former member of the country's socialist party, set up a Facebook page, which spurred the protests. Gulyas told the paper that Prime Minister Viktor Orban's plan is an attempt to "create a digital iron curtain around Hungary." "The government denies that the tax was devised to inhibit access to information, saying it is extending an existing tax on telephones, to address a growing share of communication that has moved online. "Zoltan Kovacs, a government spokesman, described the protests as an attempt by the country's splintered opposition to organize around a movement that it pretended was nonpartisan. Mr. Gulyas, he said, is 'but one of the many political activists who try to camouflage a political movement as civilian.'" Reuters explains the idea of a tax on Internet usage was first floated last week. According to Reuters, at first, the government planned to tax data transfers at a rate of 62 cents per gigabyte, but faced with protests, it decided to cap the tax at $2.89 per month for individuals and $20.62 a month for corporations. The concession, however, was not enough to keep Hungarians from the streets. "'Orban's party won all three elections in Hungary this year, including the April parliamentary ballot that gave him a second four-year term with a constitutional majority. In July, the prime minister called for replacing liberal democracy with an 'illiberal state,' citing Russia and Turkey as possible models, while trying to hold on to the country's European Union membership, the source of billions of euros of funding. "The demonstrations are 'unlikely to cause Orban's downfall,' Otilia Dhand, an analyst at Teneo Intelligence, said by e-mail from London. 'More likely, the tax proposal will be watered down in the coming days.'"